It is well known that children often struggle to solve word problems in mathematics. One strategy that is used to support students with having access to word problems is called CUBES. Another is to have students identify all of the keywords in the problem. (Update: Margie Pearse wrote a longer response to these same two strategies here). In these strategies, students are encouraged to chunk the information given in the word problem in a variety of different ways. For the CUBES strategy, the word quantities is often defined as numbers including units and direction (if given). Let’s try out the CUBES strategy with the following word problem from the Mathematics Assessment Project. Why don’t you try it yourself first? Here is my attempt, as if I were a student, on this task for just the first three of the steps in CUBES. You’ll notice that I have circled a lot of unimportant quantities. I’ve also boxed some math words or expressions that are probably not helpful. These are reasonable things to expect many students to do. How does a child know that “three-course meal” is really a description of a kind of food and not a quantity in this context? 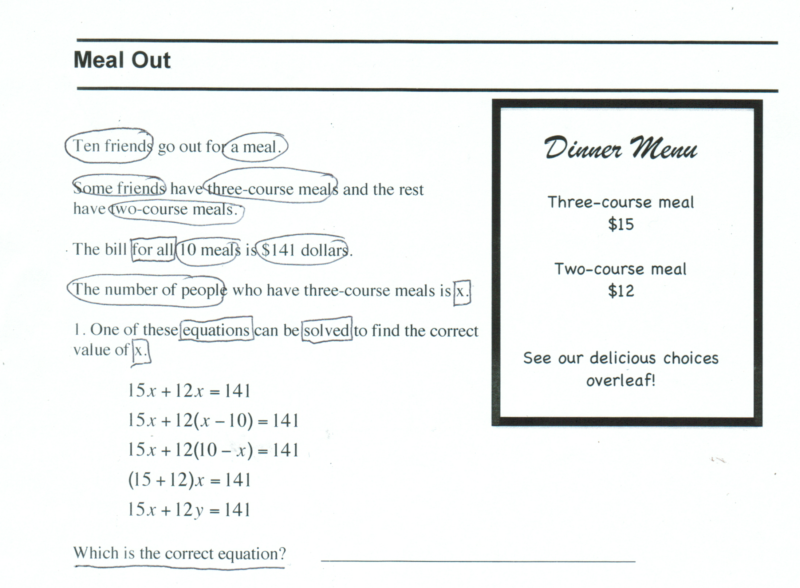 We could easily imagine contexts in which the number of courses in a meal is important. My point is that CUBES is an insufficient strategy to help students have entry to this problem. It might be helpful (sometimes) but it almost certainly not sufficient. There is a lot of thinking yet to be done before identifying the critical information from the problem and being able to solve the problem. Make sure students have access to the context itself. In this case, if students do not know what a three-course meal or a two-course meal are, it might be helpful to have pictures or a story that describes these things. If the context is one that you think you will revisit more than once, it may be helpful to act out the story. If you have students who are learning English as a new language, it may be helpful to work out, perhaps with other students in your class, a translation of the context into the language they know best. Have students restate, in a variety of different ways, what they think the context of the situation is about. This will both help students hear different ways of describing the situation and give you information about how students are making sense of the context. Let students ask questions about the context. While solving the problem for students may be counter-productive, answering questions students have about the context will both give you information about how they understand the context and give students helpful information that you may not have predicted they needed. 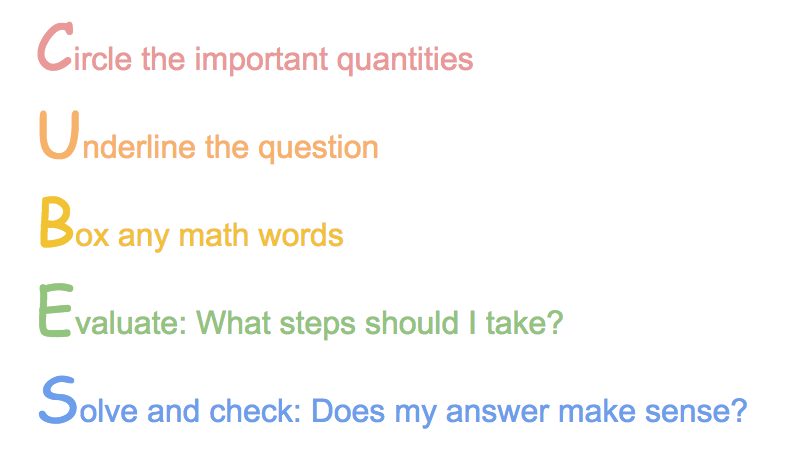 It might be helpful to have students describe the relationships between the quantities and other information given. This might be by drawing a diagram or a mindmap. For a pair of routines that may be helpful here, try Capturing Quantities or Three Reads, both described in this book. After solving the problem as a group and ensuring that everyone understands the solution(s), come back and check which information from the problem was actually useful. Over time this may help students learn how to distinguish the relevant from the irrelevant information in the problem. Is anyone really trying to use mnemonics like CUBES at the middle school level? My impression was it was aimed at solving 5th grade level word problems where you literally had to translate text into a simple one step computation. I’m actually struck more by how odd the problem chosen from the assessment project is. 1. This is yet another awful synthetic problem that would never occur in the real world. Why can’t we find problems that might actually happen or connect to something further on down the road? 2. Asking to find a single equation that models the problem from the set of possible ones. I can think of at least 2 other natural forms one might start with. This doesn’t in any way honor multiple ways of problem solving and turns the problem into a strange equation equivalence one that is even more tortured than the original “problem”. 3. The problem itself is way too simple to even need formal algebra. What I’ve seen with similar examples is that fifth graders can rapidly guess and check their way to the solution. There are only 11 possibilities after all. The power of linear systems is much more evident when ones requiring larger and usually non-integer solutions are introduced. I’m all for teaching better conceptual frameworks to solve modelling problems. But first we have to start with problems that are even worthy of it. Special ed students of all ages are taught to use strategies like CUBE and keywords. These strategies distract students from the actual relationships between the quantities, encouraging attention, time, and energy be spent on what you show here, David, to be unhelpful “stuff” about the problem. Ben makes reasonable points about this particular problem, but when I read the post I was imaging students figuring this out with a table, and the problem being used to as an opportunity for students to connect the information in the table with a linear equation, which is very important in MS and HS math. 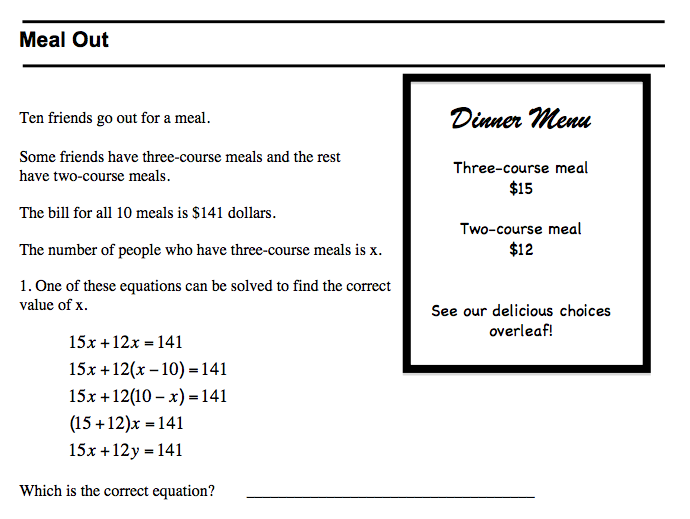 Although the correct equation is the “answer,” it doesn’t have to be the focus of the math learning in the lesson. CUBES and keyword analysis do not drive the student to connect representations. We need to upgrade the math toolbox for all students to include strategies that actually support seeing the math in the situation. Actually both Middle School and High School math teachers are using CUBES and/or keywords. I don’t know how many but at least enough that I run into them during workshops I run. As for the problem, my theory here is that if students are able to solve a problem multiple ways, including tables, guess and check, etc… then they will be able to see the connections between the equations they can create and solve and the other solution methods whereas this is more difficult when the equations are by far the most efficient method. However, yes, the use of equations here doesn’t make much sense otherwise. Let’s move past thinking about how appropriate this problem is. How might you support students in understanding this context (and then maybe using whatever method they want to solve it)? Thanks for your comment. I think we agree on students having the capacity to make connections between different solution methods. Do you have any suggestions for specific strategies teachers can try with students other than CUBES and keywords? I’ve known students in Special Ed memorizing strategies like this and solving The Problems On Their Worksheets with it, and Passing Math and getting a diploma. Then they want to get a job or go to college. Oops. I really appreciate you sharing this numeracy briefing with me. I intend to print it out and read it in detail. Good point about how these strategies (CUBES and keywords) may help students pass math class but not help them really get further in their thinking about mathematics.